I have figured out that one of my favourite aspects of reading and reviewing books for Simply Stacie is the fact that I have found a number of amazing authors who I never would have encountered had it not been for my blog reviews here! The latest author that I’ve discovered is Dorothy Howell. As I’ve mentioned before, I love mysteries and I adore chick-lit so I hoped that Shoulderbags and Shootings: A Haley Randolph Novel would marry these two genres together. I discovered that I wasn’t disappointed! Shoulderbags and Shootings,I discovered, is actually the third novel in the Haley Randolph series but I had no problem reading the novel without reading the ones that preceded it. Haley, the narrator of the story, does make mention of her previous experiences (which are chronicled in the other novels) with enough detail to make her relationships with other characters easy to understand but without making it the focal point of this novel. The only thing I found a bit annoying was that Haley seem to constantly make reference to events that occurred in previous novels and say that it was a “long story” – I understood why these lines appeared but they did get a bit trying after awhile. The novel centres around Haley, who is a woman in her 20s that has some passions in life – shopping, having the perfect handbag, finding love, looking for goals in her life and trying to stay out of trouble! Haley has just returned from England, where she spent time with her boyfriend (whose family owns the department store where Haley works) and did a lot of shopping! She borrows a car that belongs to her boyfriend’s grandmother and, rather than returning it the next day, decides to do a good deed that ends with her finding a dead body in the trunk of the car! Haley decides to try and find the killer while also dealing with her work, her friends, her love life and a stalker who is trying to hurt her! Overall, I loved this book! I found it funny, charming and really engaging! I liked Haley’s character and I loved the fact that it combined the murder-mystery elements with a number of other fun subplots! I think my favourite parts of the novel were actually the ones that took place at her job because I could relate to working in retail and hating it! The only things about the novel that bothered me were the references to events in the past and the obvious cliffhanger at the end – I understand that both are ways to try and get the reader to read other books in the series (both the ones before and the next one) but I think they aren’t necessary – this book is so good that I will be hunting down the other Haley Randolph by Dorothy Howell! 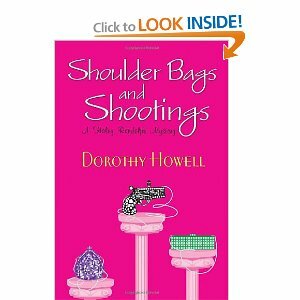 If you are looking for a summer novel that combines a murder-mystery with a lot of fun, check out Shoulderbags and Shootings: A Haley Randolph Novel by Dorothy Howell.